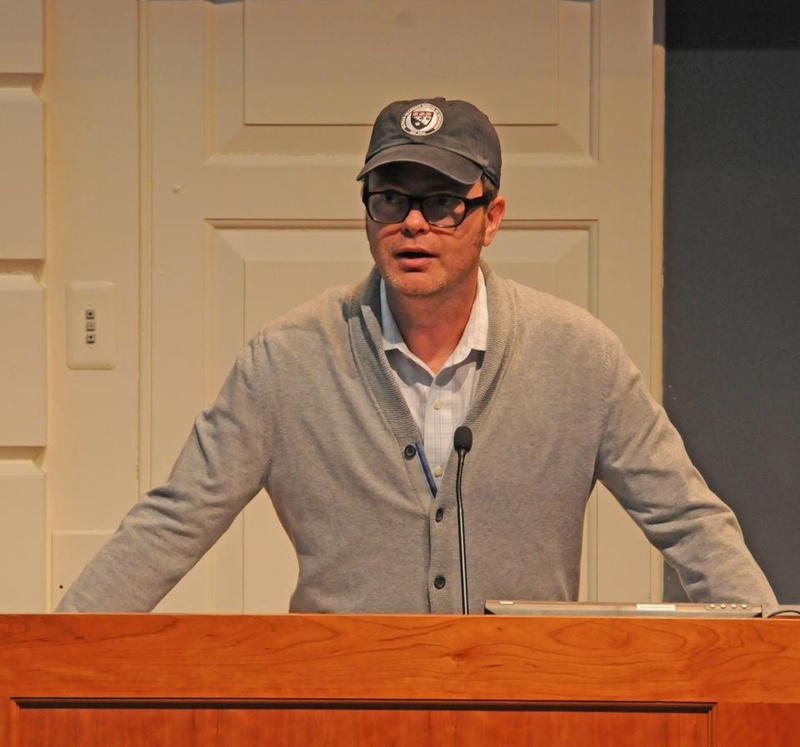 In a very un-Schrute manner, Rainn Wilson discusses the documentary Education Under Fire and the predicament of the Baha'i community in Iran while sporting a Harvard Graduate School of Education hat. Rainn Wilson, the actor who plays the awkward salesman Dwight Schrute on NBC’s The Office, urged more than 100 students on Monday to push for freedom of education in Iran. Wilson was one of three panelists for an event hosted by the Harvard Graduate School of Education that promoted the campaign “Education Under Fire” and included a screening of the documentary also entitled “Education Under Fire.” The film recounts the May 2011 attacks by Iranian authorities on students and faculty of the Baha’i Institute for Higher Education. BIHE is a grassroots university founded in 1987 to provide higher education for members of the Baha’i community, who are denied access to Iranian universities. Wilson, a follower of the Baha’i faith and a human rights activist, said that he is promoting the film because he believes humanity’s highest calling is that of service. The campaign to end the Iranian government’s persecution comes almost two months after Nobel laureates Archbishop Desmond M. Tutu and Jose Ramos-Horta, president of East Timor, wrote an open letter in the Huffington Post calling for the international academic community to aid those of the Baha’i faith in Iran who are either being imprisoned or being denied access to higher education. “Freedom of education and freedom of information are integral to freedom of thought,” the letter reads. Since the 1980s, BIHE has cautiously provided higher education in the living rooms and kitchens of Baha’i professors, according to the letter. Wilson said that when he realized the Iranian government was denying education, his eyes were opened. “Don’t take education for granted, education is a human right,” Wilson said. “It is a spiritual quality, it develops your heart and your soul,” he added. Director Jeff Kaufman explained that the Baha’i religion—a faith that promotes the unity of all religions and mankind—is a threat to the Iranian regime because it challenges the government’s authority. Wilson explained why Baha’i students applying for universities in Iran may not want to hide their faith to obtain an education. All three panelists urged students and faculty to take action by spreading awareness of the issue, urging university administrations to accept school credit from the BIHE, and promoting “Education Under Fire” events through social media. —Staff writer Nathalie R. Miraval can be reached at nmiraval@college.harvard.edu.